The leather belt is oft overlooked and simply taken for granted. This is especially true for what is often referred to as the “daily” or “casual” version of your pants’ keeper upper. 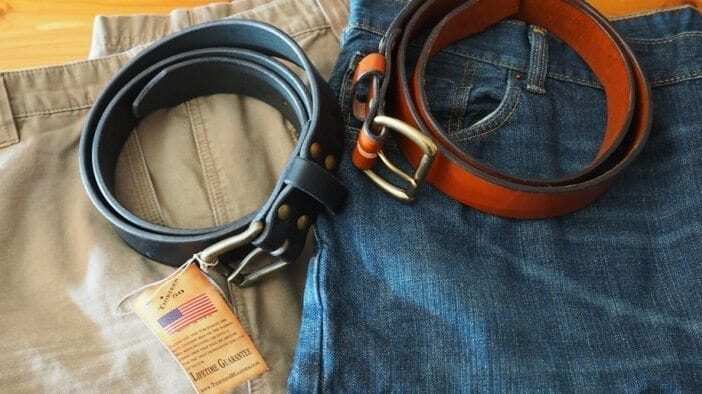 The gentlemen at Thirteen50 Leather have supplied us with two great looking belts to put to the test. They also just launched their first Kickstarter campaign, which we encourage you to check out thoroughly and support. Based is Oceanside, CA Thirteen50 is a leather company with a passion to create quality leather goods made right here in the USA. From their website: The saying, “they don’t make em’ like they used to” is said far too often in this day in age. This is sad, but so very true. At Thirteen50 we wanted to do as our ancestors did, and make a quality product at an affordable price (not to mention, offering a killer traditional look). This is a belt you could tow your truck home with…although that would be a really cool sight to see, we don’t necessarily recommend it. However, the Thirteen50 leather belt is fashioned from 12-14 ounce leather, which means it is incredibly thick and durable. The leather used by Thirteen50 is sourced from within the United States – bridle leather from Wickett & Craig or Hermann Oak. The point is…it’s tremendously strong and long lasting. The edges of the belt are nicely burnished and beveled. The hardware used is solid brass. The belt also features 4 heavy duty Chicago screws, which allow you to personalize the belt with your own buckle should that be something of interest to you. I’ve only had these two belts for a couple of weeks so far, but I really like them. The thick leather feels great and looks fantastic. The two colors I received (chestnut and black) are classic colors and go well with a variety of dress options. I like the antique brass color of the hardware on both belts and I think it compliments the leather colors perfectly. Both belts have plenty of adjustment holes in them and everything just works the way a belt should. The Thirteen50 logo is tastefully placed near the back set of Chicago screws. The folks who’ve had a chance to check out the belts thus far all have commented favorably on them…with lots of comments on the quality of the leather. Thirteen50 Leather is in the middle of their Kickstarter campaign, which is focused on these belts. In addition to the chestnut and black colors shown here, you have the option to order it in natural veg tan and dark brown…both of which appear to be excellent choices too. They’re just about to crest their goal on Kickstarter…but there are plenty of rewards left. $50 will get you a belt that later on will cost you $70. So get it while you can…and you won’t regret it. This belt, which definitely meets our Buy It for Life criteria, is backed by a lifetime guarantee, but it is designed to outlast you, so don’t worry about it. I look forward to using these belts over the course of time and I’ll definitely plan to post an update on them in the not too distant future.